Years of experience with digital transformation in healthcare industry proved that it is not as easy as it may seem. While providers keep on searching for the right solutions, we are on a mission to make this quest smooth and smart. Eventually, I came up with this roadmap of digital strategy development that leads digital transformation on its way. The way through 5 strong pillars of the healthcare industry: patients, doctors, competitors, data and value. Patients, or clients, form the target audience, in other words, the core that assigns sense to any digital transformation in the first place. It may be the most complicated element to consider. Access to information. Today’s patient is a hungry for information know-all. Unlimited access to healthcare data lets patients make more knowledgeable choices, however, increases the chances to get lost in the streams of information. Timing. Patients’ awareness triggers greater engagement. In other words, patients require more time spent on their cases. While providers have to waste time for the operations that could have been automated long time ago. Medical adherence. Even though patients got more informed, the problem of medical adherence, as old as the hills, still burns. User experience and communication. The standards of treatment, doctor-to-patient communication and the quality of service in healthcare can hardly keep up with the rate of technology development. In a world where patients demand more information, what they really want is the information presented in a clear understandable And a smart digital strategy helps to build the channels that allow patients to learn about treatment methods, physicians and medications without risks to get lost. E-Patient Dave example proves how important it is to let patients get relevant information. In this case, a patient found the treatment by turning to a group of fellow patients. Imagine the possibilities of boosting the amount of such successful cases. A smart digital transformation strategy invites telemedicine to the healthcare industry. Think of 24/7 remote monitoring, faster feedback, greater access to healthcare for patients in rural areas, and many other benefits that going digital brings. With more than a half of treatments being somehow failed due to poor medical adherence, digital technology may be the only possible way to solve this world-old issue with user-friendly apps, handy tools and better doctor-to-patient communication. Digital transformation in the healthcare means taking treatment to the next level with better access to up-to-date information. At the same time, the quality of service improves with multiple tech perks from online registrations, appointment reminders, to-do lists, and mobile payments to QR codes and quick patients’ access to their records and treatment schedules. Not to mention doctor-to-patient connection that improves into a real-time, tech-based smart communication. Digital transformation affects doctors directly, because essentially, these are the people that are supposed to use technologies in everyday practice. Skills. According to the Accenture’s report, the lack of digital skills remains a huge barrier for the doctors to successfully use technologies in practice. Workload. Even though going digital has already kickstarted new digital environment to form, hospitals still experience the gap in workflow modernization. Cost. The more the healthcare industry develops, the more the costs rise. Doctors experience this pressure both working in more strained conditions, while hospitals deal with underfunding. A smart digital strategy includes staff training as one of the basics for building healthy professional ecosystem in the industry. With multiple tools already in use (see example), it’s evident that the transformation to digital environment will go through education in the first place. According to the JournalMTM research, 82.9 percent of those who use smartphones (95.2 percent students vs. 92.5 percent physicians) stated they have used it at least once in a clinical setting. It’s a part of a digital strategy to introduce new workflows that allow doctors to increase work efficiency, improve diagnostics and treatment, and advance their relationships with patients. In other words, paperless office, management apps and tools all together can and will provide optimization and solve the problem of outdated workflow. With optimized workflow, “digital assistants”, and online tools doctors will no longer have to deal with the pressure of constrained costs and will be able to perform better to tight deadlines. On one hand, industry players compete differently, since they face different issues, from underfunding to the gaps in information supply. On the other hand, various healthcare providers tend to cooperate to perform better and for some even be able to stay in the industry. Insufficient funds. Clinics and hospitals, as well as some manufacturers, keep on confronting the challenges connected with underfunding and lack of resources. Data and resources supply. Different providers in the industry seek cooperation with healthcare bodies to build informational basis for their products and channels to let their inventions go out into the world. Digital technology performs excellently when it comes to reducing costs. In terms of underfunding that hospitals have been facing since always, it looks like the solution is on the way. Multiple examples prove that partnership between medical institutions, manufacturers and IT developers brings its returns. Think of the paperless office that grounds on the tons of data collected by existing healthcare and fitness devices like Apple Watch, Jawbone or Fitbit. Redeveloping of similar devices would cost millions and clearly make no sense. While effective merging brings returns and allows saving. High-tech solutions in the healthcare industry rely on massive data. Digital transformation wouldn’t be as valuable as it is if not for the ability to collect, store and transfer this data from one industry player to the other one. Here’s an excellent example of the way digital transformation in healthcare lets the data work. One Dutch medical center in cooperation with a large pharmaceutical company developed a CF-medication solution to optimize doctor-to-patient communication, improve e-prescriptions and manage medical adherence. Neither of the companies would be able to produce a cost-effective solution of a kind working separately. Data management has always been a complex issue in the healthcare industry. It would be hard to find more fast-changing massive volume of critically valuable data somewhere else. Volume. The healthcare industry still struggles with the need to organize the workflow of enormous volume of data. Collection and storage. High pace of industry development makes it urgent to learn how to handle real-time collected data. Management. Once the information turns into a digital format, its management requires additional technology and standards. Possibly, the only way to handle the volume of information in the healthcare industry is to turn to paperless format. This is when we call for digital technology to start grooming the future of online workflow. We live in the world of “smart everything.” Today one can hardly find a healthcare device or app that doesn’t collect and store information. What a digital strategy does is building the background for smart storing, monitoring, and transfer of digital information. Not to mention a secure access to data. When it comes to the terabytes of digital information, we think of cloud-based technologies. In fact, it might be impossible to maximize the management of the data that the healthcare has to deal with without cloud-based storages. Besides, it allows for easy access to the information available to both patients and doctors. The amount of successful cases keeps on growing. For instance, look at IBM Watson, an artificial intelligence engine that contributes to the speed and precision of decision-making, allows distant medical monitoring and smartly processes routine medical tasks like scheduling of doctor visits. Another example is, Kanta, the central electronic health records (EHR) archive in Finland. It stores all EHR data, provides 24/7 access to healthcare records for every Finish citizen, and allows data transfer to any municipal hospital. It’s evident, that any strategy should be value-driven when it comes to building a digital healthcare ecosystem. However, this side of going digital is also cut with a number of challenges. Expectations. Today patients have more clear expectations from the way the healthcare performs. Trust. The level of trust that patients apply to their healthcare providers and the industry in general requires improvement. Future. The future image of the industry requires better results from preventive healthcare. In fact, patients state their requirements from digital transformation in healthcare openly with the number of gadgets and apps they are using today. Clearly, it proves how going digital solves patients’ needs for ready-to-go healthcare solutions with user-friendly interface. 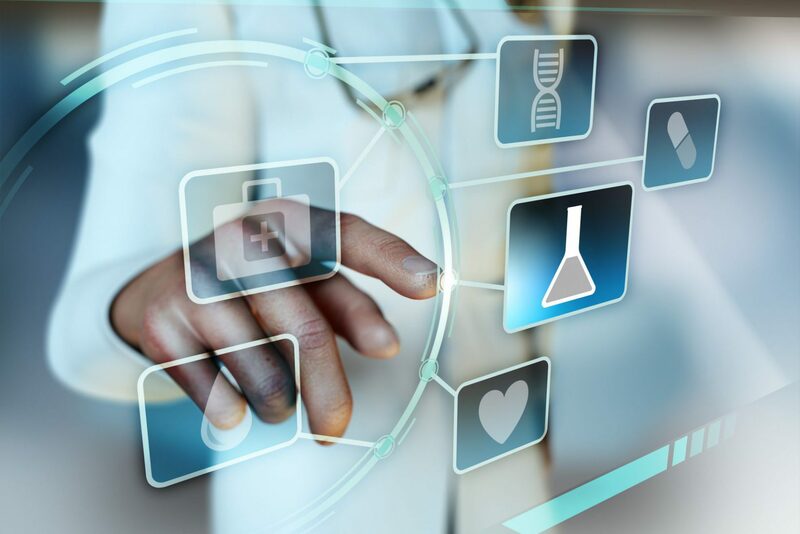 The survey by Deloitte indicates that both healthcare providers and patients require digital technologies to deliver more. Image credit: Deloitte Centre for Health Solutions, © Deloitte LLC. Digital transformation in healthcare improves doctor-to-patient communication, medical adherence, and the engagement of patients in their treatment. All together these benefits build the foundation to enhance trust between patients and doctors. Not to mention a dramatic increase in the quality of error-free decisions doctors make relying on constantly updated data and ability to communicate with colleagues in real-time. The future of the healthcare industry is in the ability to predict rather than treat. Creating new digital environment builds a solid ground for the preventive healthcare to develop and bring. The value of this transformation is hard to underestimate, because eventually it leads to an overall wellness increase not only for particular nations and populations, but for humanity as a whole. Here at Digiteum we know about digital transformation in the healthcare industry all the way from A to Z. Contact our team to share your ideas and search for solutions together. This is an abridged post, the original articles (Part One and Part Two) was published at HealthTechZone.